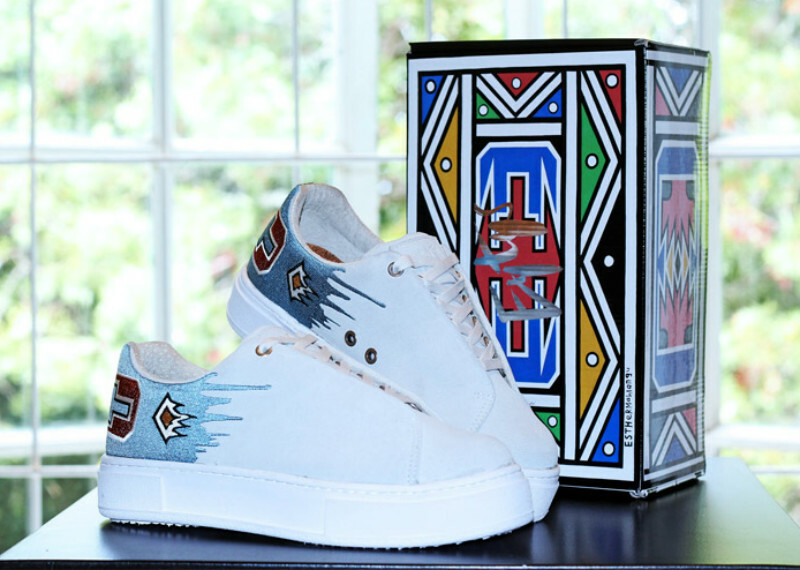 Stand a chance to win a pair of these custom made sneakers by Esther Mahlangu! Reply to Esther Mahlangu Sneakers Competition post that is posted on the Afternoon Express Facebook and Twitter pages during the Competition Period by posting a picture and writing a description of your design idea for the sneakers. 1.1. The Afternoon Express Esther Mahlangu Sneakers Competition (Competition) will be run by Cardova Trading (Pty) Ltd in association with Esther Mahlangu (Organisers/we/us/our). Entries for the Competition will open at 17h00 on Thursday, 24 November 2016 and will close at 23h59 on Monday, 28 November 2016 (Competition Period). 4.1. Reply to Esther Mahlangu Sneakers Competition post that is posted on the Afternoon Express Facebook and Twitter pages during the Competition Period by posting a picture and writing a description of your design idea for the sneakers. Only entries received during the Competition Period will be considered. 4.3. There is no restriction on the number of times you may enter, provided that each entry is unique (i.e. not the same picture). 5.1. A panel of judges, who are appointed by us, will select 1 (one) person (Winner) from all valid entries as winner of the Prize within 3 (three) days from the closing date of the Competition, subject to clauses 5.2 and 7.2. The Winner will be the entrant who are determined in the sole and unfettered discretion of the judges as the entrant who submitted the most creative and appealing entry. 5.2. We will notify the Winner by commenting on the Winner's entry post within 1 (one) from determination of the Winner to request a copy of his/her identification document in order to validate his/her entry and to request further contact details. The Winner shall be required to provide an electronic copy of his/her identification document within 3 (three) days from being requested by us, failing which the Winner will forfeit the Prize and have no claim against us. 6.3. We will contact the Winner to receive all necessary information to deliver the Prize and the Prize shall be delivered to the Winner at an address within the Republic of South Africa within 2 (two) months from confirmation of the Winner.